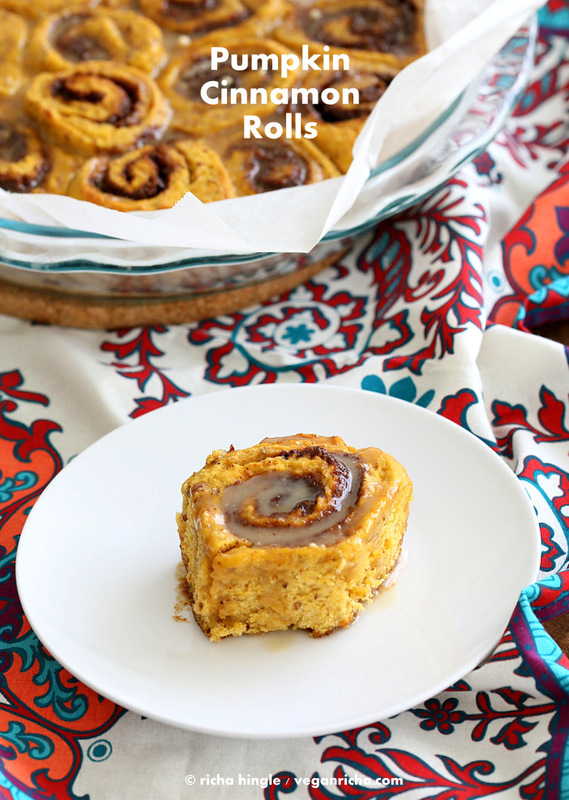 These Pumpkin Cinnamon rolls are easy, soft and ready in 1 hour! Drizzle with your favorite glaze and make them this fall. Free of Dairy, egg, corn, soy, nut. Makes 1 9 inch pie pan or two 8 inch cake pans. 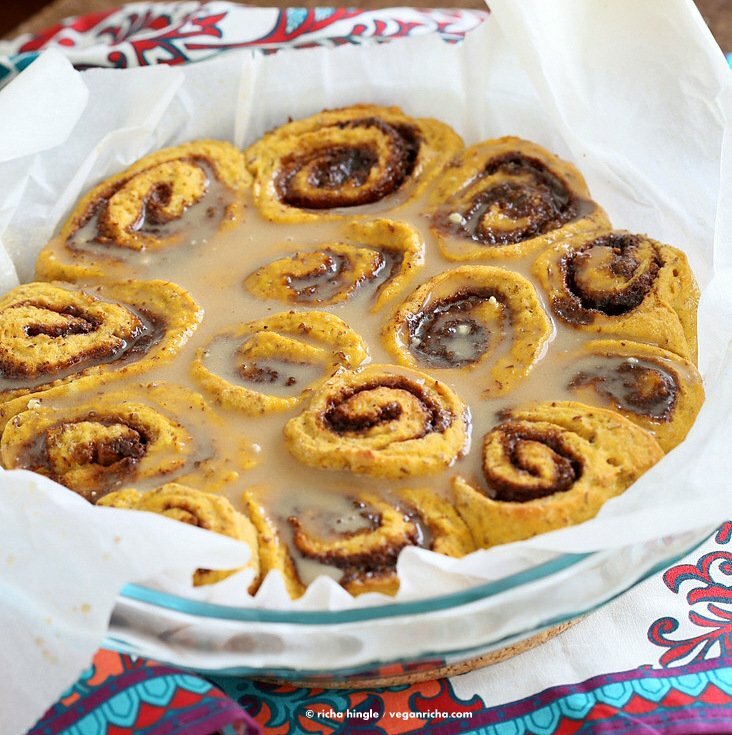 What’s fall without warm Pumpkin Cinnamon Rolls! 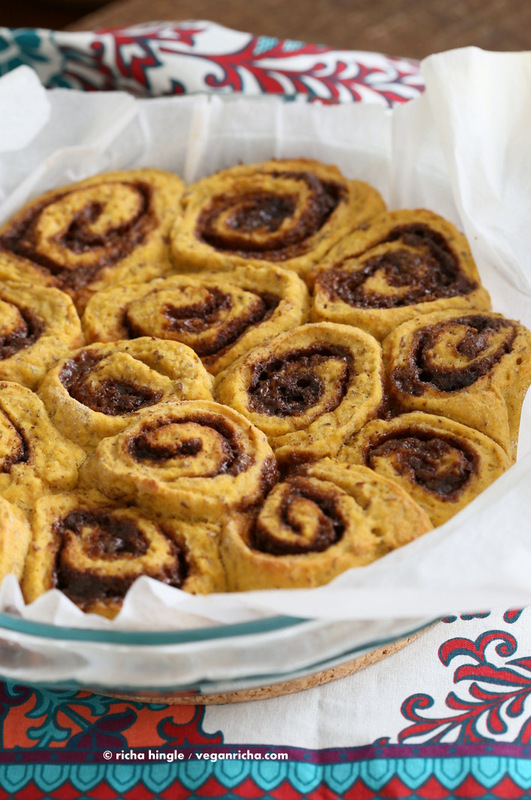 A load of Pumpkin Pie Spice, pumpkin puree in these simple rolls, which are filled with coconut sugar and cinnamon and baked to a beautiful golden. Then glazed with a simple coconut milk + sugar glaze. Add pumpkin pie spice or lime juice to the glaze. I used lime juice to add a fresh flavor burst to the glaze. Use any other vegan cream cheese based glaze. What fun Pumpkin Recipes are you making this fall! Have an hour to spare per week and can edit videos on youtube, or make videos with images, text and sound? A very wonderful rescue and sanctuary needs your help to make new and polish old videos so they can be shared via social media. 1-2 hour per week work and that too not every week, from anywhere in the world. Ping me! Believe you me, these Vegan Pumpkin Cinnamon Rolls will be a big hit! It has limited oil, it can be made without vegan butter/ palm oil and is awesome as is without the sugary glaze too! You can make it more decadent to preference with additional sugar or oil and more spice!. Add chopped pecans along with the sugar and cinnamon in the filling. Make some. For Gluten-free Yeast-free version see here. More Fall dishes from the blog including Pumpkin Cream Pasta, Macchiato, Frappucino, Pumpkin Mousse Cake, Muffins and more here. This article on Time.com- A case against Eating Ethically Raised Meat. This story of a Mama cow who wouldn’t leave her baby because the bonds of motherhood are the same in all species. Vromage – a Vegan Cheese Shop opens in West Hollywood! So fun! Moby’s piece on HuffPo about Saving the Humans because of environmental issues like dwindling supply of fresh water, grains, climate change etc. 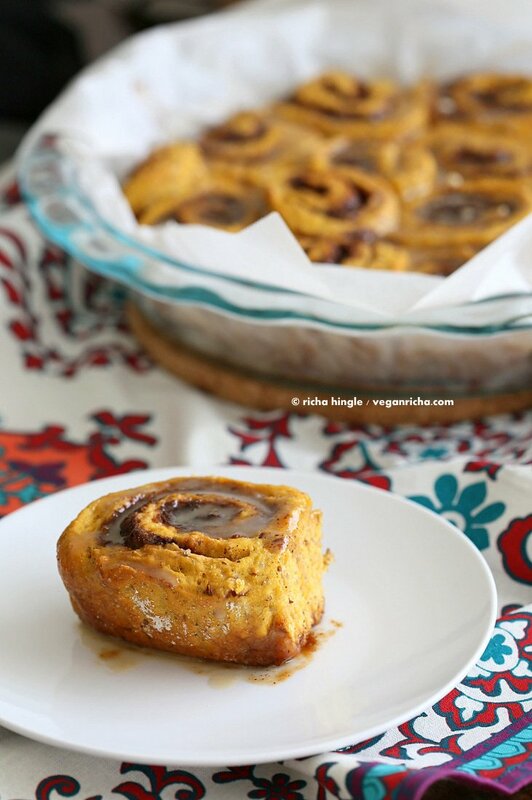 Make these Vegan Pumpkin Cinnamon Rolls! Roll it up. Seal the edge with water. Slice into 3/4 to 2 inch rolls. Place in greased or parchment lined baking pan. Let rise for 20 to 30 minutes. Take them out and immediately pour the glaze over. In a bowl, combine warm non dairy milk, yeast and sugar. Let sit for 2 minutes. Add flaxmeal, warmed or room temperature pumpkin puree and oil and mix well. In another bowl, whisk the flours, salt, spices and baking powder. Add dry to the wet and knead for a minute or 2 into a soft dough. Add more flour if needed. Using some flour, pat and roll the dough into a 24 inch by 9 inch oval-ish rectangle. Brush metled butter or oil on it. 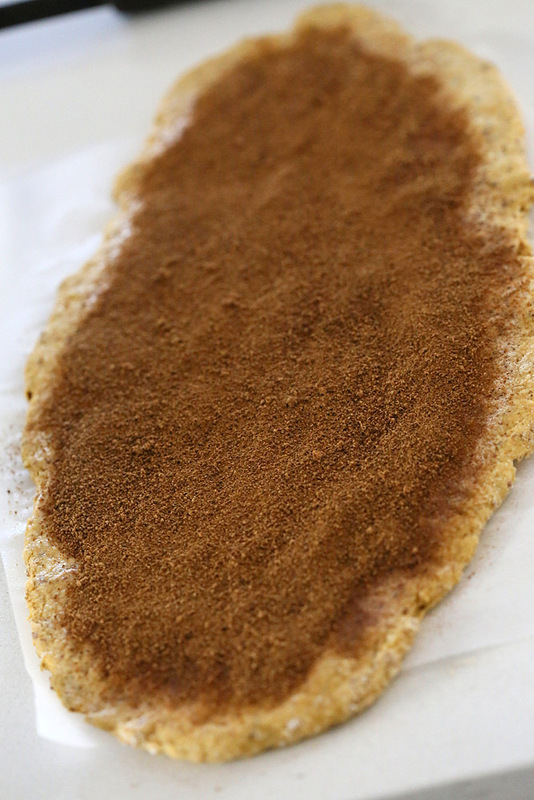 Sprinkle coconut sugar and cinnamon. Start rolling from one side to make a long 24 inch roll. Brush water on the other side to seal. Meanwhile make the glaze: Blend everything under glaze until well combined and keep aside. Bake the rolls pre-heated 375 degrees F / 190ºc for 15 to 18 mins or until golden on some edges. Immediately pour the glaze over the rolls. Let sit to soak for a few minutes before serving. You can make these as decadent as you like with added vegan butter, more sugar in the filling etc. shared at VVP this week. these look so fabulous, lady! i love the idea of lime juice as a glaze. who would have thought? i love the light freshness in the glaze.. there is so much warm spice in the rest of the rolls, that the glaze pops it all nicely! love your recipes and these look amazing! Just one quick question . The glaze calls for coconut milk. Would that be canned ( culinary) or carton ( drinking/thinner)? Keep up the good work. I make 1-2 of your trcipes a week! its canned, full-fat. 🙂 updated the recipe. There is no pumpkin in the recipe so I’m disappointed. Sure, spices are nice, but I was hoping for some bonus nutrition (ie at least some pumpkin, because that’s in the name). I think you missed it. there is 1/2 loaded cup pumpkin puree in the rolls. see in the rolls ingredients, flaxmeal, then oil, then pumpkin puree. Oh yum! These just might be exactly what I’ve been looking for. I’ll have to adjust a few things for my family’s diet requirements/allergies but I think I can easily do that. Thanks! I LOVE these! 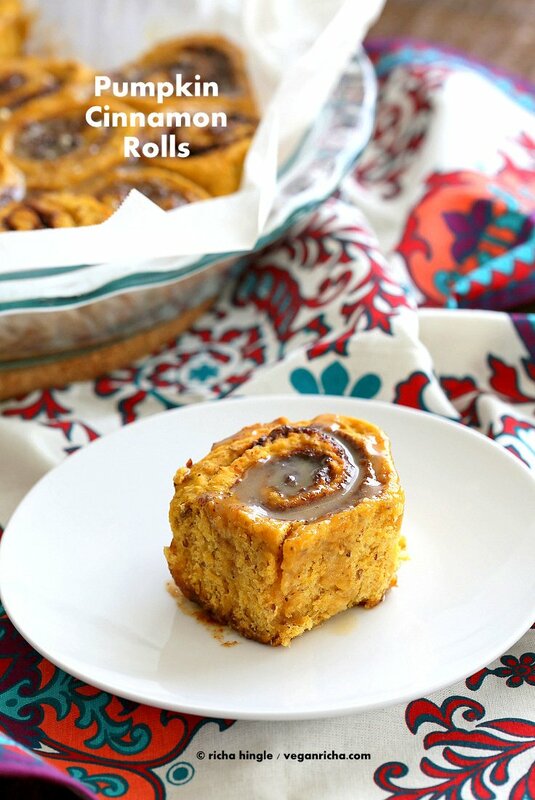 I was actually planning on making pumpkin cinnamon rolls this week (along with PUMPKIN EVERYTHING ELSE), but I never thought to add lime to the glaze. That’s such an interesting idea! Will have to give it a shot. Thanks for the inspiration, Richa! the recipe might not work with direct substitution. You can try it with any gf flour blend and gf oat flour(or just use more regular gf flour). make sure the gf flour blend has some starches and gum in it. Add 1.5 cups flour and then see if you need more to make a soft slightly sticky dough. 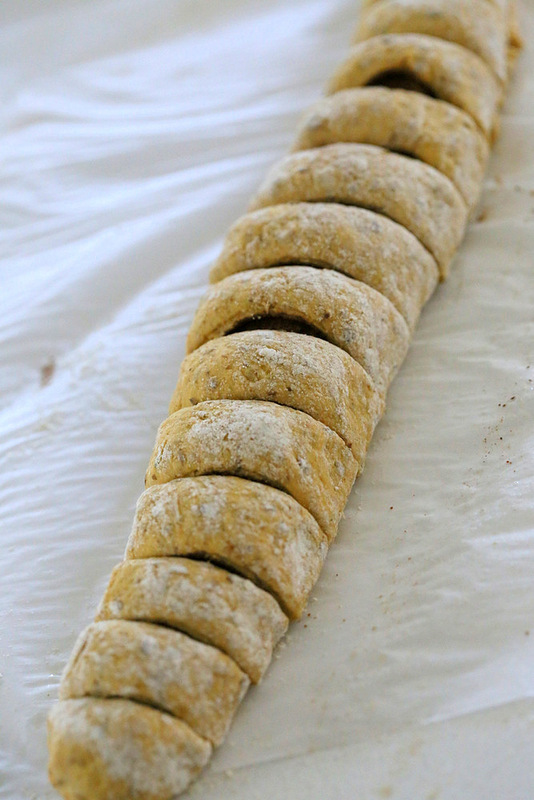 the dough will also be difficult to roll out, so roll between parchment. Made these tonight, and they turned out fabulous!!!! Thanks so much for a great recipe!!! Can I substitute the yeast? I don’t use yeast in our kitchen. Made these for breakfast. They’re the lowest fat/sugar cinnamon rolls I’ve ever seen (and they’re yummy). 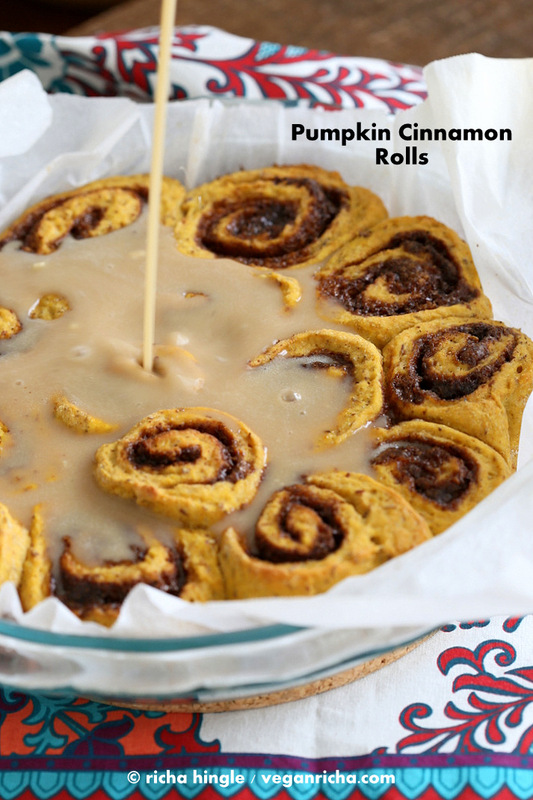 This looked so delicious when I came across it this morning that I made my own version (minus the pumpkin) that very instant! Soooo delicious! I linked to your blog. Thanks, again! Do you think I could make these up the night before and let them rise in the fridge? yes. make the rolls with the flling . cover with parchment and refrigerate. Let them come to room temperature before baking. about half an hour. 1. I have every flour in the book but oat flour…rice, whole wheat, ancient grains…what is a suitable substitute? 2. For the glaze…is that regular sugar, raw or confectioners? 3. I bought light coconut milk…would the vanilla almond milk I have be better or can I use it? Thanks, looking forward to another Richa masterpiece! I usually use pumpkin in savoury dishes but want to try out some sweet pumpkin dishes. This one looks amazing and I love cinnamon. Oh my gosh! These were so incredible. We ate them with a vegan cream cheese frosting for breakfast! These look so frickin’ good! I’m moving into a new house next week and these are going to be the first thing I make inmy new awesome kitchen – can’t wait! Can I substitute the unbleached flour for regular bleached flour? So yummy looking! Can’t wait to try! Do leftovers (if any) need to be refrigerated? Yes, refrigerate them as the pumpkin in them will tend to spoil them faster. they will be fine out for 1 day. I made these *AWESOME* Pumpkin cinnamon rolls tonight, along with your banana bread with toasted walnuts & coconut earlier this afternoon. For the icing on the cinnamon rolls I used powdered sugar, almond milk and vanilla bean powder. I adore your Indian Kitchen cookbook — (your tofu scramble???? ???? so delicious !!). Of course, I preordered your Everyday Kitchen and received it the day after release. I can count on your recipes to come out perfect! On your website, THANKS for making a lot of your recipes “Instant Pot”friendly!! Your hard work is very much appreciated! Thats awesome! So glad the recipes turn out well! Thank for you for getting both the books! Yes that tofu scram is a favorite. 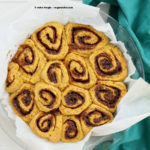 I just made a vegan pumpkin cake roll, wish I could attach a picture! 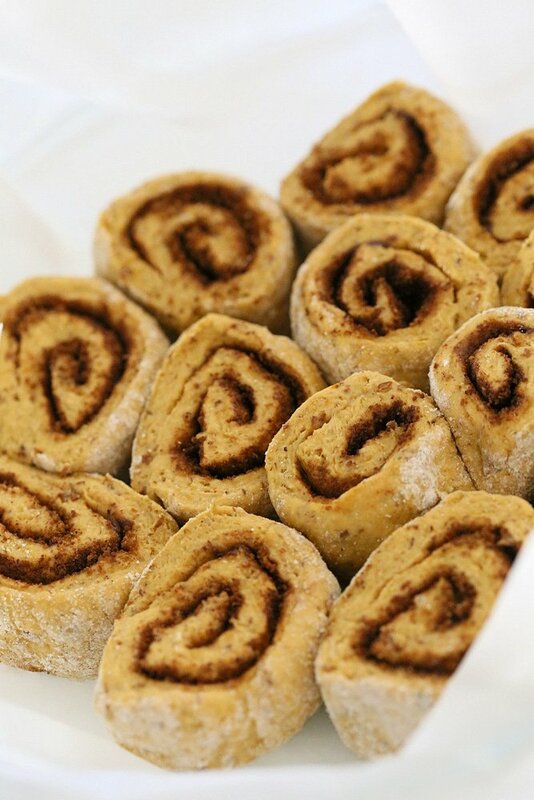 Can’t wait to make these cinnamon rolls when my mom comes to visit this Fall, thanks for the recipe!